I have never enjoyed working out, nor have I really needed to. But after 2 children and gaining over 20kg, I was looking for a programme to help me back into shape. This is where I found Terence and The Strength Yard. As a personal trainer, Terence is patient and fun while at the same time methodical and target focused. Every training session is different as he adjusts the training to my condition on the day, recovery efforts and ensures that I am improving and motivated. 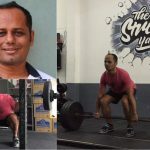 PT Strength training with Terence at the strength yard has totally changed my perception of exercising and improved my physique and strength immensely. Well done Terence and thank you!